Founded in 1988, the museum highlights over 400 species of insects, mammals and birds from around the globe. Some of the collections are more than 100 years old and all the animals found at the museum were donated by various government agencies, wildlife rehabilitation centers, captive breeding programs, zoos, and individuals. This air-conditioned attraction includes dioramas depicting wild animals in their natural settings, videos, interactive computers, and hands-on exhibits to promote wildlife appreciation and conservation. The museum is open Monday - Friday: 9:00am to 5:00pm Saturday & Sunday: 9:00am to 6:00pm and is available for private events. 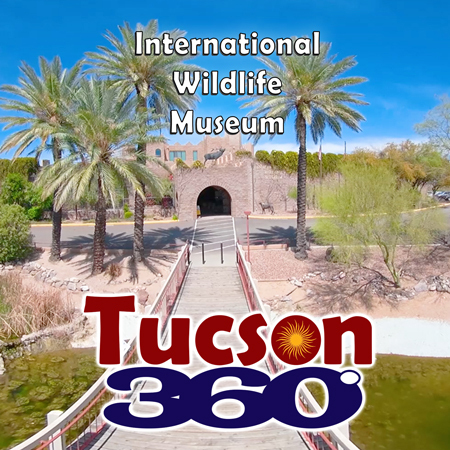 Thank you for watching this Tucson 360 production, if you're watching this on YouTube, be sure and subscribe as we will be publishing many more of these interesting 360 videos.